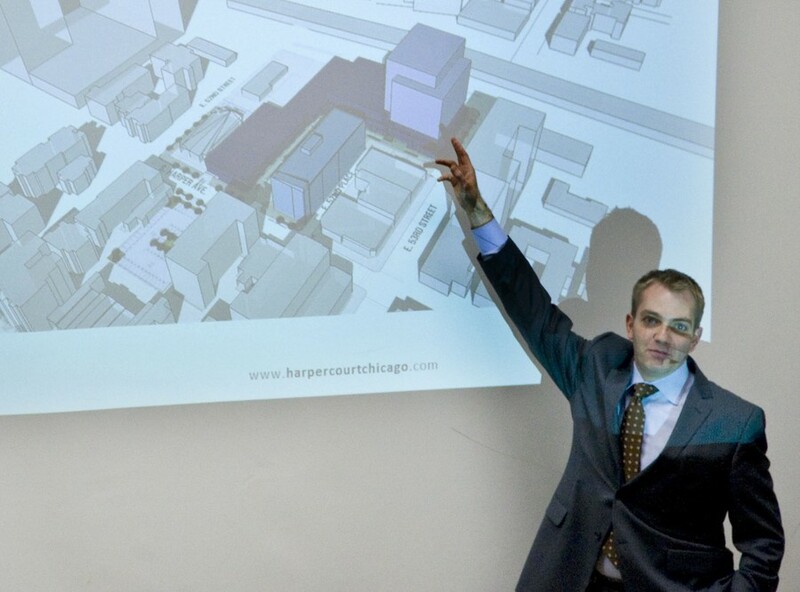 Developers tried to settle concerns about the financial security of the Harper Court development. Developers of the Harper Court retail center met with the Hyde Park 53rd Street Tax Increment Financing (TIF) Advisory Council to address fears about the project’s financing in the face of recent tax reforms, as well as to assuage community members’ concerns about the development’s community impact. David Cocagne, president and CEO of Vermilion Development, and Christopher Dillion, the company’s managing director, reported that the project’s financing is secure, though they admitted that the budget surpluses they expected initially now seem unlikely. “The original projections were overly optimistic,” Cocange said. The project was expected to have a $20,000 annual surplus. However, with the 2009 passage of Cook County’s 10/25 Ordinance, tax rates on the commercial property have dropped, which may cost the project $1.25 million in TIF financing. The ordinance may hit the surplus for upcoming years as well, though possible solutions include seeking private sector funding, pursuing development elsewhere in the 53rd Street TIF district, and extending the time frame for the district’s TIF debt from 24 years to 36 years. Still, Beth McGuire, the city’s project manager, insisted the project will still have sufficient money for completion, citing the banks’ confidence in the endeavor. “Nobody would be approving this if there wasn’t enough money to pay for it,” she said. The project has already secured funding for its first phase, which includes retail, parking space, and an office tower which the University has already leased. Students and community members aired their concerns as well. First-year and Southside Solidarity Network (SSN) member Sofia Flores objected to a Hyatt Hotel that will be built there. SSN objects to TIF funding being used to support a project that works with the Hyatt, which SNN claims mistreats its employees. “We want to make sure the workers have rights,” Flores said. Kiley Russel, owner of Big Girl Cosmetics on South Harper Avenue off 53rd Street, claimed that construction workers are hurting business by taking up parking spaces in the area. “We’re being crushed,” she said. Construction on Harper Court began in August and will conclude by summer 2013.